Nothing catches the eye like a glimmering crystal. 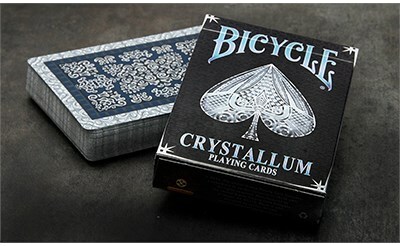 Well... feast your eyes on the brand new Crystallum Playing Cards from Collectable Playing Cards. You will treasure each and every card as you shuffle through the artfully crafted design. Make sure you get your hands on this as it is the first deck created under CPC's 1000 deck club. The only way to show off this gem is in a display case. A truly original card deck. Printed by the USPCC.